Don’t tell my mother, but I have the original Cranberry Salsa recipe. The one clipped from a newspaper long enough ago for the paper to be yellowed. True confession. For the past couple of years she has called frantically asking if I have the recipe copied down because she can’t find hers. I manage to pull it out of my memory er recipe box. It’s that good. This delicious relish gladly replaced the tired old cranberry sauce at our home on Thanksgiving a very long time ago. In fact, I don’t remember a Thanksgiving without it. There is nothing not to love about this salsa. It’s perfect with the turkey, fabulous drizzled over cream cheese, it even stands alone on a Ritz. My brother goes gaga over this recipe so I make enough for the masses. I have included the original measurements, but I actually quadruple this recipe. I think you will want to double it for sure. I’ve indicated my quadrupled measurements in parenthesis just as I did years ago on the original recipe clipping. 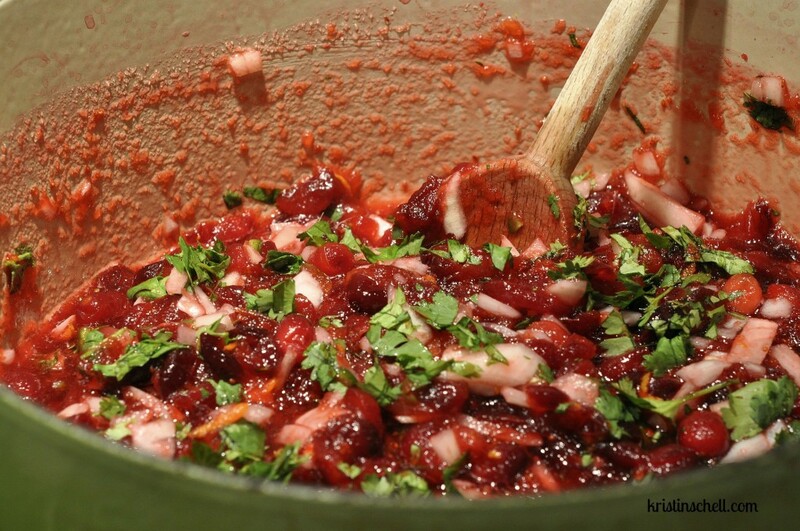 In a large saucepan, cover cranberries with water and bring to a boil. Cook for 2 minutes. Remove from heat and drain cranberries. Add sugar while cranberries are hot. Stir to dissolve sugar. Add remaining ingredients and toss until combined. Leave at room temperature until cool and then refrigerate. Make this a day in advance … it’s best the two days after you make it. Oh, yum! Thanks so much for sending me the link! This looks great. I bet the tart of the cranberries is really, really good with the heat from the peppers. Bookmarked! Basic question–fresh or pickled jalapenos? Good! I can make it before we leave for TX and then enjoy it while we’re there! Thanks so much for sharing this with me! I’m going to bookmark it so I don’t lose it!! Have a great Thanksgiving! I look forward to more of your recipes! I also made this. 🙂 The Schell Cafe was alive and well at my Thanksgiving. 🙂 It was quite good! I did use some Anaheim peppers along with my jalapeños. I’m excited to make turkey flautas and eat them with my leftover salsa! Thanks for the great recipes! Do you leave the carnberries whole? Thanks- sorry for the spelling! Pressed enter too quickly! Another question- what is the best way to chop the cilantro. I end up with it stuck all over my hands. Stella – make sure the cilantro is really dry. If it still sticks (and it will!) just be grateful your hands smell like cilantro and not garlic? 🙂 Happy Thanksgiving. So glad to have you around the cafe. Looks wonderful! How long do you think it stays fresh? What if I attempt to can it in jars to have for later? What do you serve with this other than turkey? Would you just eat with tortilla chips? We served it with turkey, eat it with tortilla chips, and it’s great with a yummy cheese on crackers as an appetizer. I made it! Wonderful!!!! I think I need to make more though — you were right about doubling/quadrupling the recipe. It disappears quickly. Thanks for sharing this recipe Kristin. Can’t wait to make this! How many servings? Do you deseed the jalapenos or just chop them? Hey Laura — I usually deseed them to keep the salsa from being too spicy. What would you recommend if I didn’t reseed them? To make it less spicy? Just made it. Yummy! Can’t wait to serve it on Thursday.